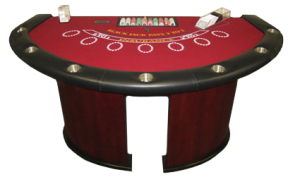 Casino Party Planners are ready to help you with planning your next casino party or casino event. Below are some charts to help you in your casino party planning. Please call us at 317-857-0168 in Michigan if you would like to talk to one of our professional Casino Party Planners. 1) The total number of guests that will be attending. 3) The amount of square footage you will have available. PLEASE NOTE: As a general rule for corporate events at any given time, approximately 70% of your guest will be playing at the Casino tables. Also please keep in mind that the fewer people you have in attendance, the higher the percentage will be of guests that will be playing at any given time. For example, with a private home party, the average percentage of guests that will be playing at the tables will be closer to 90%. Our professional Casino Party Planner will be more than happy to assist you with planning any casino event that will best suit your needs. We can be reached at 317-857-0168 in Michigan. The following chart is only a recommendation. You may not need as many tables or perhaps you may want even more. Every Casino Party can be customized to fit your group. Please contact our Casino Party Planner for assistance with your specific event OR you can fill out the form on our Contact Us page.